The HP Photosmart D7460 Photo Printer does a reasonable job of producing photo prints for a budget printer. This review was published on April 25, 2008. Since then, this product may have been discontinued or replaced. Pricing and availability may differ from what is stated in the review. The HP D7640 comes with a setup guide and a basics guide. The setup guide is a 16-page pamphlet that's color-coordinated and graphically describes the setup process. The pamphlet does a good job of walking you through the setup with clear instructions and pictographs. There is little room for error in the setup of this printer, but the detailed instructions are good for those of us who may miss the obvious or are new to some of the features, like WiFi. The basics guide is a total of 84 pages, but only 38 pages of it is written in English. The remaining pages are dedicated to French. The basics guide is basically a slight expansion of the setup instructions plus some added instructions on tools, features and troubleshooting. Of the inks, the HP Photosmart D7460 comes with a Black ink cartridge (16ml), Cyan ink cartridge (4.5ml), Magenta ink cartridge (4.5ml), Light Cyan ink cartridge (4.5ml), Yellow ink cartridge (4.5ml), and Light Magenta ink cartridge (4.5ml). Also included are the software CD for Windows and Mac, setup guide, basics guide, power supply and the power cord. Setting up the HP D7460 was a pretty effortless. Outside of taking the printer out of the box, set up was simple and consisted of removing the orange tape, screen seals and putting the inks in place. Installing the inks was surprisingly a fun task. The ink cartridges look like something out of a playdough can or a box of Legos. The bright colors and rubber-like feel of the cartridges make inserting the inks more of a child's game, something out of an Easter egg hunt, than a task. The cartridge slots also are reminiscent of rollercoaster seating, with its push-down, lock-in latch. The main driver control for the HP D7460 is the HP Solution Center. At the top right corner of the HP Solution Center sits the name of the printer in view. HP's Solution Center picks up on any HP printer driver your computer. You can change which printer you want information about by clicking on the left vertical bar of the Solution Center. Underneath the name of the printer, in this case it is "HP Photosmart D7400 Series," sits the "Status" link. You can click this to view general information about the printer: whether it's connected or not connected. It also holds two links on the left side: "View ink levels" and "Cartridge Information." 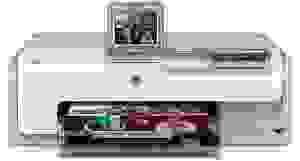 The "View ink levels" link will take you to the HP Photosmart D7400 Series Toolbox, which has four tabs for your choosing, one of which is estimated ink levels. You can also configure your Bluetooth device and execute printer cleaning through the toolbox. The HP D7450 comes with two main software: HP Photosmart Express and HP Photosmart Essential 2.01. Photosmart Express pretty much lives up to its name, allowing you to view, save, share, order or print your photographs. Photosmart Express doesn't allow for anything that you couldn't do anyway on your computer. The good thing about Express is you don't have to go to an outside website to order prints, it allows you request an order straight from the same window you'd choose to execute any other request, like printing, saving or sharing. Photosmart Essential 2.01 offers a very unique feature that makes organization and sharing photos easier: tagging. This tagging feature allows you tag your photos by assigned names to objects or people within the photographs. You can tag all the photos of an album or just a select few. If you have family or vacation photos, you can assign each photograph with names of people or places.